This is not an attempt to excuse Anakin's bad decisions and wrongdoings, but rather an explanation of the psyche behind one of the best-known (and least-known) characters in cinematic history. Weak. Selfish. Whiny. Arrogant. Badly acted. Immature. These are the most frequent adjectives I hear used to describe him, and these are the words that gall me. They show a distinct lack of understanding, an inability to grasp the complexity of the character that is Anakin Skywalker. Along with hatred for the prequels, hatred of Anakin runs almost as rampant, as people disparage his characterization and reduce him to a shallow, two-dimensional shadow of himself. I gave myself homework before I sat down to write this article - I re-watched the prequels and took notes to refresh my memory. I take this project very seriously. Why? Because Anakin was the first character I was truly, greatly attached to. I was fourteen when I first saw Revenge of the Sith, and I cried harder over that movie than any movie before. The next time I watched The Return of the Jedi, I sobbed when young Anakin smiled proudly at Luke from the netherworld of the Force. Anakin was the first character to awaken every feeling in me - from I need to write characters this deep to my BABY. The first complaint most people have is about Hayden Christensen's acting. When Hayden explained why he quit acting after the prequels, the majority of responses were, "I thought he quit acting before the prequels." The only thing is that Hayden did nothing wrong where Anakin was concerned. Before the prequels, Hayden's resume included B-list indie films and made-for-TV movies. He had never starred - let alone acted in - anything major, and then suddenly he's cast in something as major as Star Wars. Hayden was a teenager thrust into one of the biggest movie franchises in history, and he was given one of the worst movie scripts ever to grace the silver screen. "From the moment I met you, all those years ago, not a day has gone by when I haven't thought of you. And now that I'm with you again... I'm in agony. The closer I get to you, the worse it gets. The thought of not being with you- I can't breath. I'm haunted by the kiss that you should never have given me. My heart is beating... hoping that kiss will not become a scar. You are in my very soul, tormenting me... what can I do?- I will do anything you ask." If that isn't hard enough, try saying them realistically from the perspective of a teenaged boy. One of the most impressive things about the Star Wars movies is that, in spite of perpetually wooden and unrealistic scripts, the actors manage to bring life to the frequently awkward, stiff, and sometimes-plain-ridiculous lines they're given. Hayden was no exception, delivering his lines the only way they could sound even slightly realistic. Everyone knows Attack of the Clones was a hot mess in many ways, but Revenge of the Sith is another ballgame and my favorite film in the franchise, with The Force Awakens and A New Hope taking second and third place. The script for Revenge of the Sith is noticeably better, in large part due to the lack of attempted seduction. Anakin and Padme are actually married, and the strain of 'falling in love' (is that what happened in Attack of the Clones? Because it's kind of hard to tell) is gone. Hayden does an excellent job of portraying Anakin's emotional conversion to the Dark Side, even though the script is still flawed. And even if you still think his acting was poor (and I highly disagree), at least have the courtesy to treat a hardworking, humble young man with a basic little thing called 'decency.' He's human, too. When we first meet nine-year-old Anakin Skywalker, he's a fatherless slave on a desert planet with no hope of having any kind of freedom. Qui-Gon, Obi-Wan, and Jar-Jar walk into Watto's shop, and when Jar-Jar accidentally turns a destructive robot on, Anakin pipes up and instructs, "Hit it on the nose!" This eager, helpful attitude is characteristic of Anakin. His big heart is clearly demonstrated - he brings the Jedi home and he offers to fly in a pod race. He should be withdrawn and critical considering the life he's led, but he's wide-eyed and hopeful, zealous to please and keenly observant. 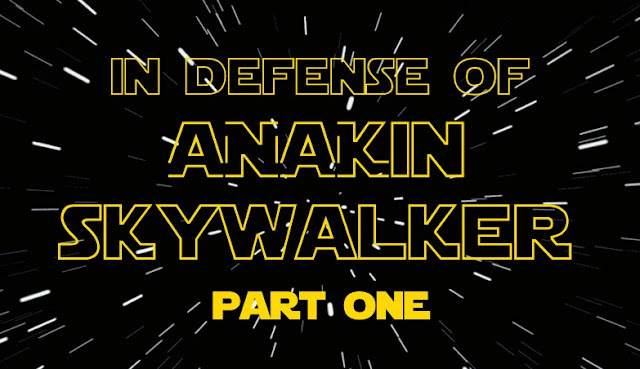 We get to know Anakin, whose point of view is both innocent and profound for one so young. "Mom," he says, when Shmi tells him a pod race is too dangerous, "you said the biggest problem in the universe is no one helps each other." He has listened closely to tales of Jedi and Angels, longing for something beyond what Tatooine has to offer, and yet he never complains about his position as a slave. He has plans to leave someday, after he locates the explosive tracker implanted inside him and his mother. He tells Padme, "I'm a pilot, you know, and someday I'm going to fly away from this place," but still he never whines or complains about his lot in life. His mother is the one he wishes had it better, caring for her well-being over his own. When Qui-Gon secures Anakin's freedom, Anakin's first reaction is, "But what about my Mom?" And, upon discovering she can't come with him, he says he isn't going. Shmi encourages her son to leave, wanting a brighter future for him, but she is still where his heart is. In fact, when Qui-Gon brings Anakin before the Jedi counsel, his mind is still with his mother and not his own new and frightening situation. Here we see plenty of foreshadowing - fear of loss will eventually lead to Anakin's downfall and the rise of Darth Vader. However, we also see the reason behind that downfall - Anakin is taught that missing someone - that feeling attachment - is wrong, and yet he can't help himself. Anakin cares deeply about people, as is demonstrated time and time again throughout the prequels. Obi-Wan is less than thrilled about his Master's decision to mentor Anakin. "The boy is dangerous," he tells him. "They [the Council] all sense it, why can't you?" Therein lies an interesting aspect of Anakin's character arc. It's a known psychological fact that how you view and treat someone will influence how they turn out. If you tell a child they're worthless, they will believe they are worthless. If you tell a child they're pretty, they will believe they are pretty. If you treat a child as dangerous, the child will believe they are dangerous. Something to note as Anakin grows up. When Attack of the Clones starts, we see Anakin has grown into a powerful young man caught in a very awkward place. It's hard, at first glance, to tell where the bad script begins and Anakin ends, but once you've seen it as many times as I have, it becomes easier to untangle the two. Anakin is headstrong, emotional, and reckless; but he still possesses a kind heart and an eagerness to please. His presence is treated with conflicting reactions: the Jedi Council has never stopped viewing him as a threat and holds him at arm's length, regarding him with a mixture of suspicion and displeasure, while Obi-Wan and Padme treat him with love but also condescension. He is hailed as 'The Chosen One' and simultaneously treated as an outcast. Obi-Wan constantly refers to Anakin as 'My very young Padawan,' 'My young Padawan,' 'My young Padawan learner,' etc. While at the end of Revenge of the Sith Obi-Wan says, "You were a brother to me, Anakin," Anakin tells Padme, "He (Obi-Wan) is like my father." Clearly, there's some miscommunication happening - Obi-Wan might view Anakin as an equal, but he fails to treat him as such. In fact, the only person who treats Anakin as an adult is Chancellor Palpatine. Little wonder that Anakin trusts and is drawn to the one man who claims he views him as an equal. We also see conflict in Obi-Wan's behavior versus the instructions he gives Anakin. While he's quick to call Anakin reckless or impetuous, we see Obi-Wan take a flying leap out a window, where he proceeds to latch onto a droid and take an extremely risky, dangerous, high-speed flight through a busy city at night toward an unknown enemy. He exhibits a 'do as I say, not as I do' attitude, which, while it comes across as very unintentional, is still very obvious. Anakin is constantly trying to please everyone. He tries to please Obi-Wan, he tries to please the Council, he tries to please the Chancellor, and he tries to please Padme - and yet he rants to Padme that nobody trusts him. The thing is, he isn't lying - he isn't treated with trust, and he is held back. He might be complaining, but he isn't wrong. There are many things the Jedi do not encourage. They do not encourage strong emotion, they do not encourage attachments. They do things by the book (something even Obi-Wan frequently has trouble doing) and they claim passivity is the way to true power. It's natural these teachings would not sit well with any emotional person. In fact, we find a huge contradiction within Jedi teachings, and they're two of the most-quoted Jedi phrases. The Jedi code encourages the Jedi to be in tune with their feelings but does not teach how to handle emotions. It's an interesting idea, in theory, but it was a flawed idea that frequently failed when put into practice. When Anakin returns to Tatooine fearing for his mother's safety, he tracks her down and finds her in a camp of Tusken Raiders. She has been their prisoner for a month, and he finds her as she's dying from whatever torture they have inflicted on her. She breaks out of her haze, enough to recognize him, and her dying words are, "I…love…"
It's a stark contrast to what happens next. Overwhelmed with emotions he doesn't know how to control, Anakin commits a heinous act and slaughters the entire camp, sparing no one. He takes his mother's body back to her new family's home (and the future home of his son Luke), filled with hatred - but also regret. In fact, he immediately throws himself into doing what he does best - into fixing something. "I'm good at fixing things," he tells Padme, and it's true. Anakin has always been someone who wants to help, to fix, to save. To repair broken things. And yet he's just 'broken' an entire village, and he's overwhelmed by it. Now, I will state this: while slaughtering the village was obviously a turning point for Anakin - a step toward the Dark Side - I do think it was mishandled. He killed an entire village, George. You really shouldn't just have Padme hug him and then gloss over what happened. It was inexcusable. I'm not saying he doesn't end up paying for it - he does, and dearly, but it was not properly dealt with. Still, I think the most interesting this is that his first instinct is try and put something back together. When things fall apart around him, all he wants to do is fix them and make them better. That's always been one of his strongest characteristics. Another thing I find interesting is his attention to those usually classified as 'the little people.' He says 'thank you' to servants, he's polite to droids, and he cares about the individual Clone Troopers. He hasn't forgotten where he came from, and because of his slave origins, he's very aware of the importance of those people who are usually overlooked. During a conversation with Padme, she asks him if Jedi are allowed to love. He says no but that they are encouraged toward compassion - which, he says, is unconditional love. "So I guess you could say we are encouraged to love," he tells her. Anakin is a person of extremes - he loves deeply, he hates passionately, and he struggles with the 'middle ground' the Jedi advocate so highly. Anakin is not a two-dimensional character. He's conflicted, and we watch as that conflict clearly - and painfully - takes him down the path to the Dark Side. You might cover this later, but I like Anakin in Star Wars: Clone Wars, which from my knowledge doesn't involve Hayden or the writers of AOTC (though I'm not condemning people's perception of Anakin based on the acting of a young actor being thrust into this huge franchise & wooden dialogue). Thus, he definitely has more to him than two feature films. Clone Wars show his recklessness & his care for all people (He goes out of his way to save R2 when other people tell him "it's just a droid.") THIS POST IS GOOD. I'm EXCITED TO READ MORE. I think we need this. Because I've never had a problem with Anakin (only his romance story, which felt like a letdown). So yes, deep characters... good. Very good article. I agree entirely. Well done.